Moist open habitats. Moist prairies, alluvial terraces, marshes. OH, IN and KY west to ND and MT, south AR to CO. May have been introduced further east. 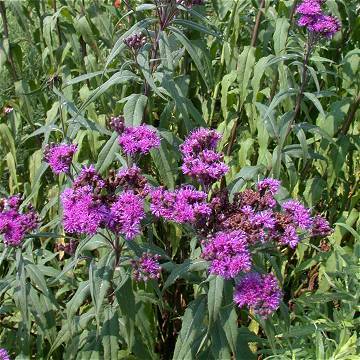 Herbaceous perennial to 1.4 m. Stems often red or purple, mostly glabrous but often puberulent above. Leaves alternate, sessile or subsessile, glabrous, denticulate to sharply serrate, pitted-punctate beneath. Inflorescence flat and dense, to 10 cm wide; flowers 10-26; involucre 5-9 mm, the principle bracts rounded to subacute, entire or sparsely ciliate, often glabrous on the back; pappus tawny to purple. There are two varieties. The more eastern variety is var. fasciculata and occurs from OH, IN, and KY to MN, eastern NE, eastern KS, and eastern OK.